In last week’s premiere episode of Rizzoli & Isles 6B, creepy psychiatrist Joe went off the deep end by abducting Maura to get back at Jane. The good news? Jane shot him dead. The bad news? He has an accomplice who’s still out there. The second of last week’s double dollop of R&I saw both Jane and Maura on edge as they grappled with this reality, and the looming threat persists in this week’s episode. In fact, the first conversation we hear between Jane and Maura in Rizzoli & Isles 6×15 involves Jane backing out of the deal that would have secured her a new condo because her previous one was set on fire and she fears for the safety of any potential new neighbors. Instead, Jane’s going to continue to stay at brother Frankie’s apartment, so she can put his neighbors in danger instead. What? I don’t get it either. Maura comes up with a counter-offer: a (free-standing) town house. Is she finally asking Jane to move in with her? Nope, just volunteering a professor friend’s house for Jane to sub-let. Jane, you need to get better at seeing silver linings. As they head to the crime scene, Maura delves into why Jane doesn’t seem entirely happy about the impending nuptials. And Jane prefers scalpels to guns any day of the week, wink wink. Oh, right, there’s a woman’s murder to solve. The crime scene is an abandoned warehouse that seems eerily reminiscent of the dilapidated old mental hospital where Maura was held by psycho psychiatrist Joe, and although Jane quickly offers to bring in Kent as the M.E. on the case instead, Maura declines, claiming to be fine. Further exploration reveals an improvised torture chamber, some blood (later determined to be fake), the DNA of a mystery woman who isn’t their victim, a bloody boot print from a man’s shoe, and a digital encryption key linked to a local bank manager. When Jane and Korsak speak with the bank manager, he reveals that the warehouse hosted a Fear Club gathering the previous weekend. What’s the Fear Club? As the banker phrases it, “You buy a ticket, they scare the hell out of you.” As Jane phrases it, “A haunted house on steroids.” Well, I didn’t expect to be dusting off my Halloween puns in February, but that sounds spooktacular – except for the part where a person died for real. As for the ongoing case involving Jane as a victim rather than a detective, Jane’s having a hard time staying uninvolved in what her colleagues are doing. “He’ll make a mistake, and you’ll be there to catch him,” Maura assures her, but she’s frustrated. Apparently the computer science professor Nina turned to was able to identify a signature in the work of the person who hacked into Jane’s bank account, and Korsak dispatches Nina to speak to one of the victims. It’s Nina’s first real foray into field work since moving to Boston from Chicago after her boyfriend was killed in the line of duty, and it’s a success! She gets a name, not to mention a couple of endearing bonding scenes with Korsak. Korsak and Nina bring their suspect in, and Jane watches from behind the glass of the interrogation room as they fail to find any connection to Jane’s case. It seems the hacker was simply hired for his talents. Maura draws upon her recollections from the time she was abducted and says she believes Joe’s accomplice is older than the hacker, based on the tone Joe used to speak to his partner on the phone. Remember that whole “Maura’s fine! Who else is fine?” routine at the crime scene? When Angela walks in on Maura researching PTSD, the M.E. admits she’s not doing as well as she’d like people to believe. As Rizzoli & Isles 6×15 winds down, Korsak tells Jane he’s planning to propose to Kiki and admits he was concerned to share the news. I kind of want to cross-stitch that second sentence of Jane’s on a pillow, but I don’t know how to cross-stitch. Anyway, there’s much debate about how the proposal should go, with Jane in favor of Fenway Park during a Red Sox game while Maura’s thinking champagne and a string quartet. Hopefully they’re both taking notes for the inevitable Rizzles proposal, but in the meantime, Korsak simply asks Kiki at the Dirty Robber as their friends and colleagues applaud. Before I go, here’s a cool factoid for ya: The girl Jane busted for conning Nina (and eventually half the police department) into buying “raffle tickets” (read: helping her save money for a puppy) was Angie Harmon’s real-life daughter, Avery Grace Sehorn. Two more facts: Avery’s sisters’ names are similarly spiritual (Finley Faith and Emery Hope), and the family actually does have a puppy. Do I know too much about Angie Harmon? Probably. 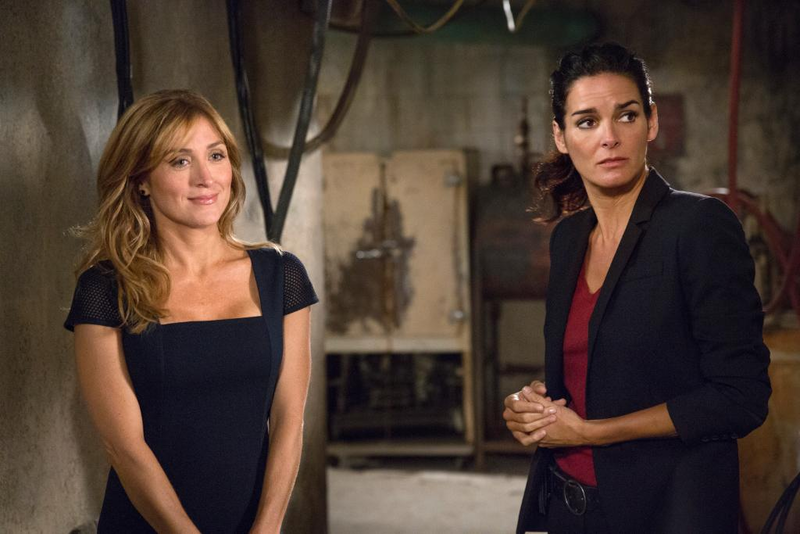 What did you think of Rizzoli & Isles 6×15? Thanks for the comment, Carol! Angie’s an interesting person, for sure. Avery’s rocking that zebra costume!